GEOSTREAM is carried out by researchers at Fraunhofer FOKUS in cooperation with international partners. 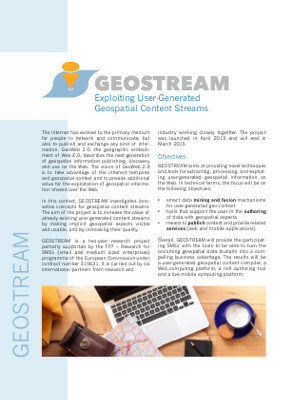 The aim of the project is to automatically analyze existing user-generated content streams for example from DBpedia, Foursquare, or Flickr and to extract spatio-temporal information with the help of data mining technologies. This information can be combined with other data or self generated content using smart data fusion. Applications using the technologies developed, range from the creation of travel books to geomarketing. As part of the project new concepts for data mining and data fusion are developed and integrated in a mobile computing framework. The framework will allow for gathering new information in real time and link them to own data using their temporal and spatial contexts. The framework is demonstrated by a mobile research and authoring tool for authors of travel books. The author is supported by an intuitive interaction concept with automatic capturing of his situation such as the location. As a result the demonstrator will show the combined work of all individual components during extraction, processing, and use of user-generated information streams.